Moving with a companion animal adds an extra layer of complexity. Whatever stress you experience on moving day goes double for companion animals, who have no idea what to expect from the commotion of a move. But, with some strategic planning and a little bit of elbow grease, you can make the transition easier on yourself and your companion animals. Make sure your dog or cat wears ID tags at all times, because the likelihood of pet kids becoming separated from their people goes up dramatically during a move. If you maintain registry with a national microchip agency, be sure to update your contact information. Once you’ve moved, call your veterinary office to update your address and phone number. Did you know that a rabies tag includes the contact information for your vet’s office? It’s a built-in safeguard if your pet kid ever becomes lost, so make certain your veterinarian has your most up-to-date contact information. Call your local animal regulatory office and/or homeowner’s association to learn of any rules or legislation regarding companion animals in your new neighborhood. Moving a family dog is pretty simple. Keep your dog on a leash, buckle his car harness and drive him to his new digs. If your new place features a fenced yard, show him the locations of his food, water, bedding and kennel [if your dog spends part of his day outdoors]. The new sights and smells will likely keep them occupied for hours. If there’s any anxiety, consider using a calming herbal supplement. Aside from canines with compulsive disorders, most adapt to new routines relatively quickly. Relocating cats can prove a bit more complicated. Cats not only bond to their people but they bond to their territory as well. As many outdoor cats are free-roaming, it can be difficult to get them to stick around long enough to establish a new territory. There are many stories of cats ending up back at their old addresses after a short-distance move, and other heartbreaking stories of cats being lost forever after a long-distance move. To keep your cat safe before, during and after a move, confinement to a secure space is required. Before the move, keep your kitty in an empty, climate-controlled room. The room should include a litterbox, bedding, food, water, toys and a scratching post (clawing is a fantastic stress reliever). Post a sign on the door, letting movers know the room has been cleared and that it should remain closed at all times. When transporting him to your new home, I strongly advise using a portable crate. If your cat is apprehensive about car travel, only going for rides to see the veterinarian, lightly spray the carrier with a feline-hormone spray that reduces stress. Put something inside the kennel that reminds them of home, such as a favorite toy or a pillowcase that smells like you. 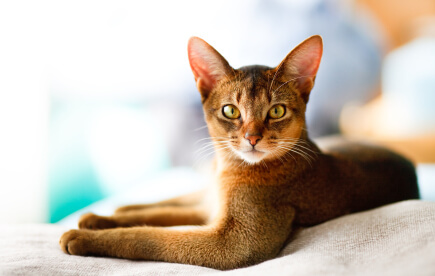 Even if you are staying at a hotel, you should not let your cat out of the carrier - even if your kitty complains, it’s necessary to keep your cat safe, as frightened cats are likely to dart. Keep the carrier partially covered with a towel or sheet so it feels like a den. Once you’ve reached your destination, set aside a room (such as a bedroom or bathroom) to serve as a transition area. This simple step will help your kitty become acclimated to your new home. In these instances, the best medicine is time … giving your cat the personal space to settle in. Visit occasionally while you unpack, providing food, water and treats. If there’s a window, consider setting up a perch, which will give your kitty a view to his new world. Do not let your cat out until the movers are gone, the furniture is arranged and you can keep an eye on your furry friend as he explores the rest of the home. If you would prefer not to confine your cat to a safe room, consider boarding your cat during the move. For his protection, staying at an extended-care spa or a vet’s office offers a comfortable, caring solution (also good for dogs, too). If you’ve ever considered training an outdoor cat to become an indoor-only cat, moving is a great opportunity to do just that! Short distance moves within the same neighborhood can actually prove more problematic for cats than moving to a completely new area. If your kitty knows he’s near his marked territory, he might drive you bonkers trying to convince you to let him out. In a new neighborhood, however, your cat has no established turf, so he should be less likely to prowl-yowl. If you still want to allow your cat outdoors but have concerns for his health and safety, consider investing in a harness and leash. I hope that you’ll find these tips helpful, and wish you and your pet kids a safe move and a future of happiness in your new home.